Director: Jason Reitman. 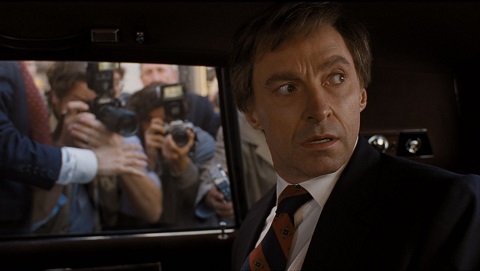 Cast: Hugh Jackman, Vera Farmiga, Chris Coy, Mamoudou Athie, J.K. Simmons, Molly Ephraim, Alex Karpovsky, Oliver Cooper, Sara Paxton, Josh Brener, Mark O'Brien, Alfred Molina, Jenna Kanell, Kevin Pollak, Bill Burr, Steve Coulter, John Bedford Lloyd, Ari Graynor, Tommy Dewey, Kaitlyn Dever, RJ Brown, Spencer Garrett, Mike Judge, Steve Zissis. Screenplay: Matt Bai, Jay Carson, and Jason Reitman (based on the book All the Truth Is Out by Matt Bai). Twitter Capsule: On one hand, story, POV need more honing. On the other, poses opposite sides of many problems and lets us decide. VOR: ② I appreciated that latitude for varying viewer response and the view of campaigns as leader-focused yet diffuse. But little felt new.